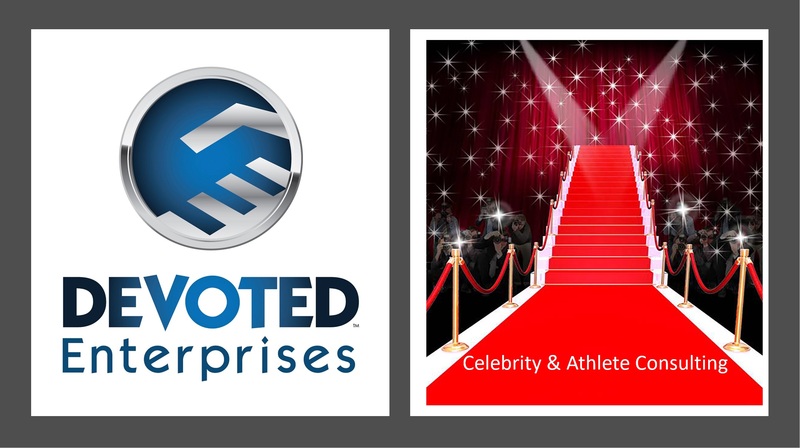 Celebrity & Athlete Consulting - Devoted Enterprises Inc. Most people don’t think of famous people as being business owners, but in fact our experience shows us that most public figures, celebrities and athletes have many business dealings going on at the same time! As you can imagine, they are approached all the time with “great business and investment opportunities”. But how can they know what is truly a “safe investment” of their time and money. That is where we can help! Our goal is to help you ensure discretion, maximum profitability and to make sure that you as a public figure are not taken advantage of by those who want to take advantage of your name and success. With Devoted Enterprises, you can rest assured that you will be treated like royalty regardless of your profession! We have worked with current and former professional athletes for years and this makes up the largest part of our celebrity consulting. We are very aware of how these professionals are approached all the time to spend their money and to invest into deals that others think “are a sure bet”. They also have many interests and ventures that they want to do on their own such as non-profits and foundations. We have helped them launch new ventures and non profits, make more money in their existing business dealings, purchase other organizations, and engage in partnerships with other entrepreneurs, all while ensuring that their interests are protected and their profits are as healthy as possible! Becasue of our dealings with professional athletes and those that help them with their businesses, wealth management and more, we have had the chance to work wither others in the spotlight such as celebrities, news anchors, public officials and more. This list is growing everyday! Whatever your needs are as a public figure, we can help!